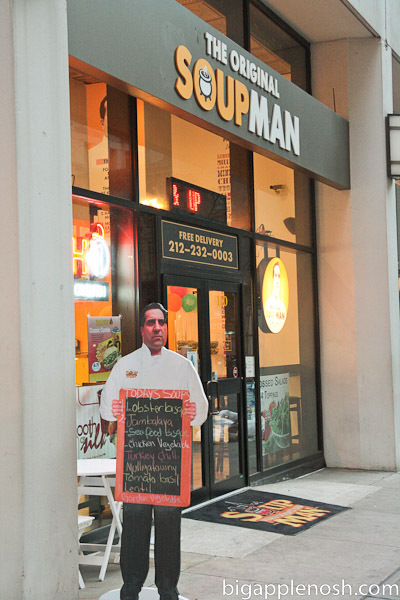 I was recently invited to try a free cup of soup courtesy of The Original Soupman. As it was a sponsored meal (a rare occurrence – this was my second freebie), I’m not giving a rating – you can see my sponsored meal policy here. Now that that’s out of the way, let’s get started, shall we? Undeterred and motivated by the prospect of sponsored soup, I entered and evaluated my choices. Featured that day were lentil, mulligatawny, seafood bisque, jambalaya, split pea and tomato. 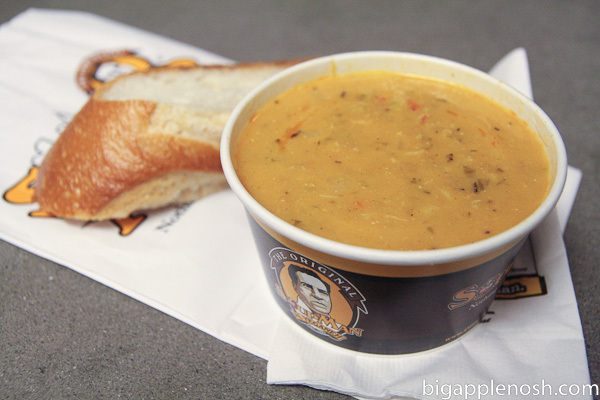 My heart was set on one of my personal soup faves though – the lobster bisque (first photo). The soup is served with a hearty chunk of baguette; I looove carbs! But how was the bisque? This is definitely my personal preference, but I tend to favor bisques that are creamy, rich and thick. While The Original Soupman‘s bisque was indeed generous with the lobster meat, it was not as creamy as I like – with a focus more on the broth than the cream. Soooo, if you prefer a more brothy bisque, this will be for you. If you’re looking for a creamier, pink-ish bisque, this definitely isn’t it. That’s not to say I didn’t still finish it! 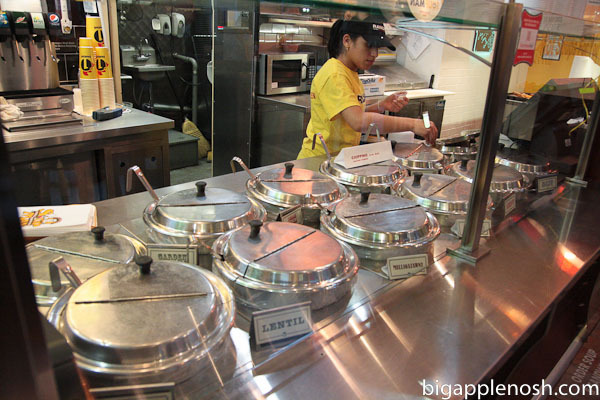 In all, I’d be willing to give the Soup Man another go, this time sampling a different soup. Like you, I love creamy lobster bisque – with a drizzle of truffle oil over the top for good measure. Yum! soup is so comforting, and those flavors sound yummy. I picked lobster bisque from your list too! Closely followed by tomato basil. Now I want soup. D'oh! mm lobster bisque. I'm with Kim – bring on the truffle oil! The "no soup for you!" guy? How fun! They have frozen soup at my grocery store that I *think* is the Original Soupman..I think. Anyway, adding this to my places to visit in NYC! 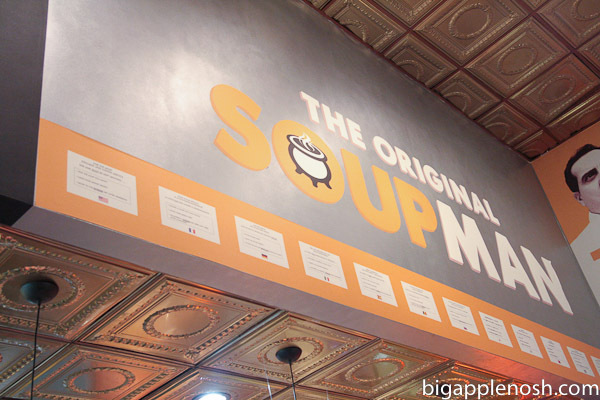 I loooove soup, and that place looks like it would be a ton of fun to go to! I love a good lentil soup or a pumpkin soup! YUM! lobster bisque!! i love a creamier kind, but won't turn down any 😉 now i must find some to enjoy. That is making my stomach grumble uncontrollably loud! yummy! i love lobster bisque both creamy and not. I love this seinfeld episode.